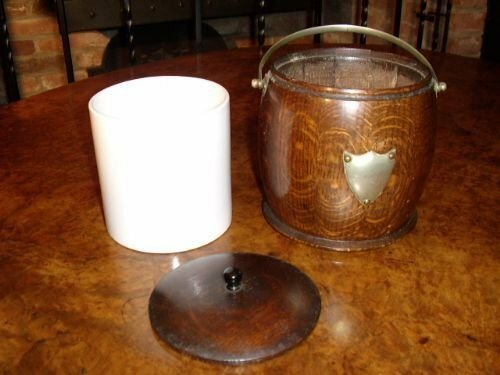 A hand crafted oak biscuit barrel with nichol silver palted loop handle,having a white original porcelain liner,and small shield to inscribe to someone. 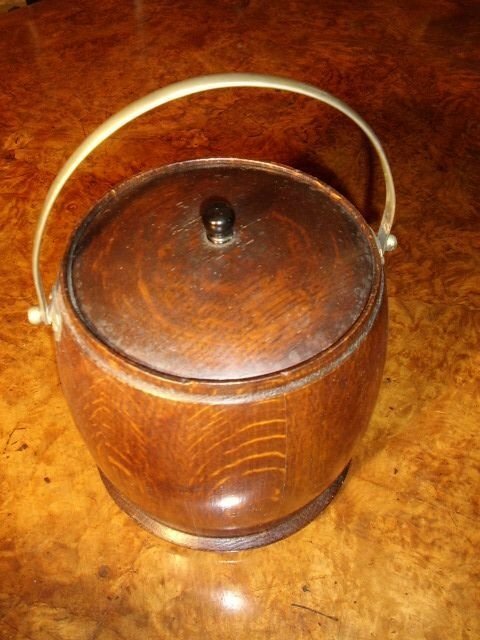 The oak container has a round fitted lid with little ball to use to lift off and is all in good condition. 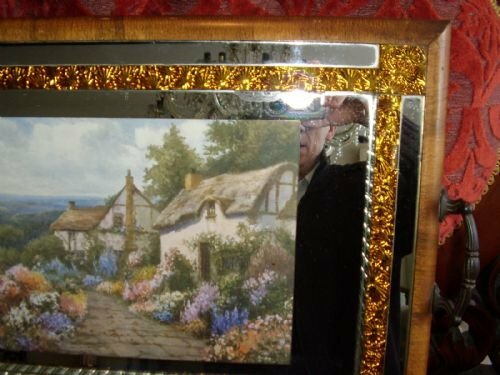 which can has been bleached out to make it less visable. 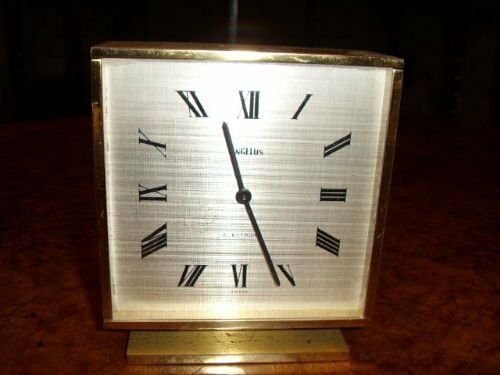 A collectors Swiss made Electronic Clock manufactured by Angelus in a buff matt solid brass finish,with roman numeral painted stainless dial. 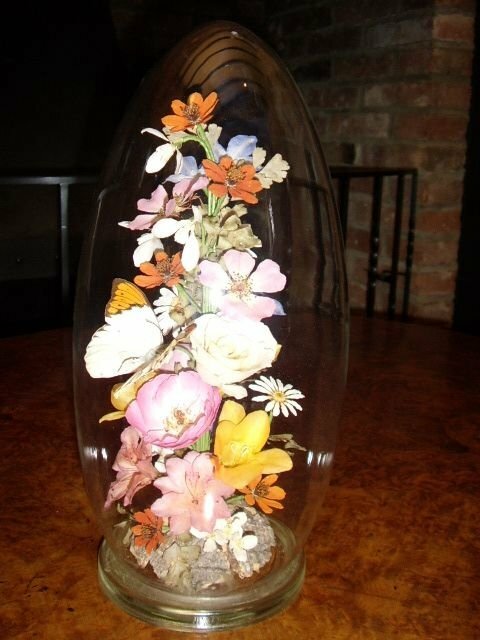 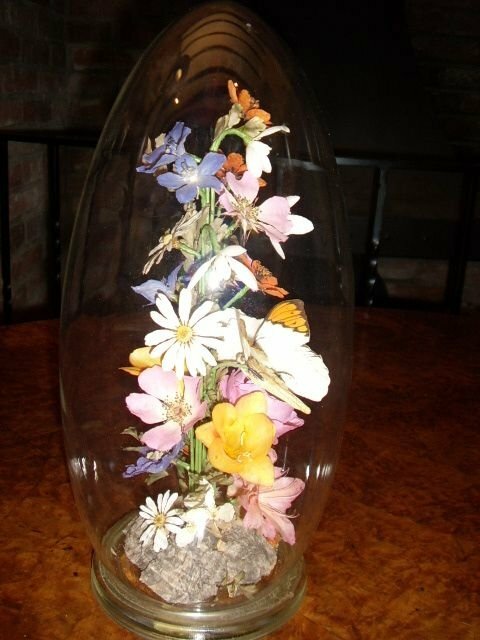 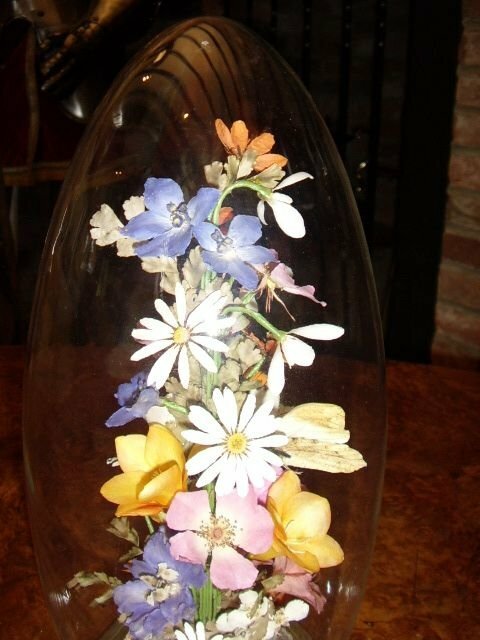 A fine example of a dried flower display under glass dome,with a sole butterfly resting. 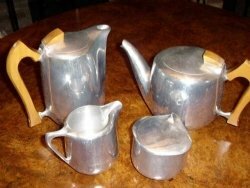 All in good condition with no deterioration seen. 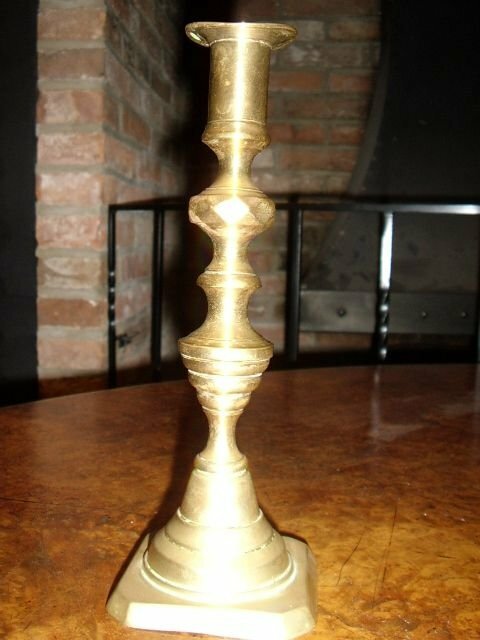 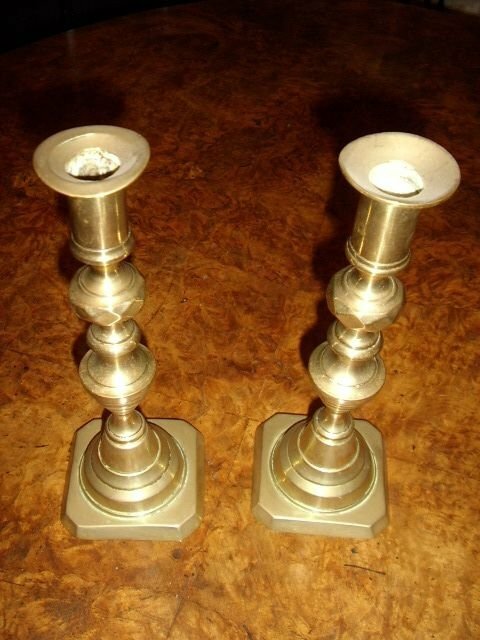 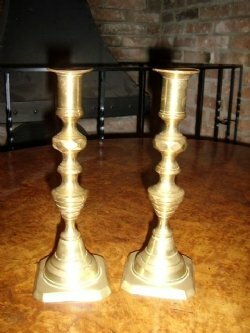 A pair of Victorian period solid brass candlesticks,which still have their original rods underneath for pushing out the old candle and wax.Both are nicely polished and in good condition. 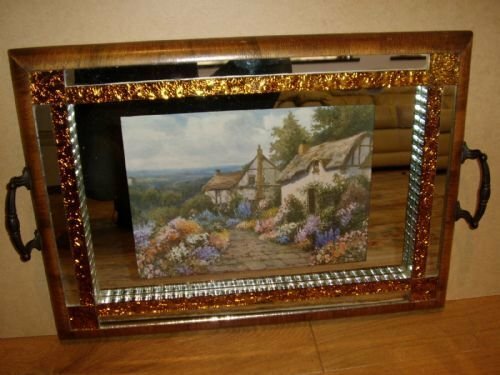 A rare surviving Art Deco mirror backed drinks tray,enhanced with the glass blockwork inset design,surrounded by a bright yellow imitation glass array of sunflowers. 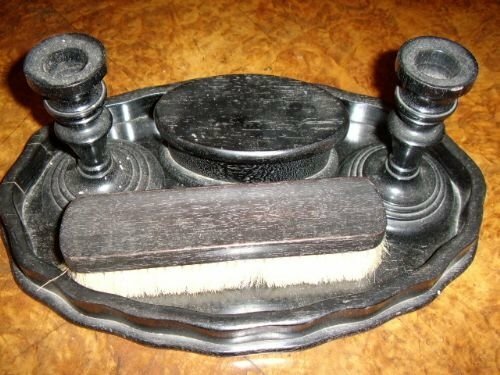 The frame of the tray is nicely veneered in a poloshed medium coloured walnet,with a solid pair of delicate cast iron handles for lifting. 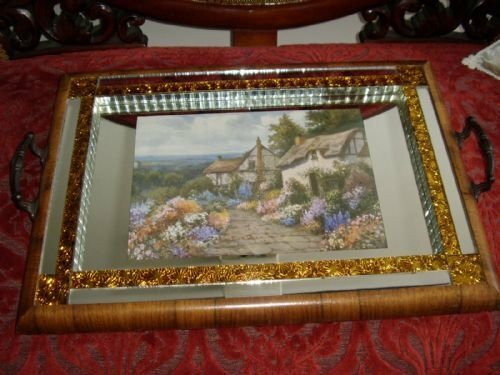 The tray has a beautiful country cittage scene showing a pathed walkway lined with blooms of flowers. Good condition generally for the age,with just a mark in the mirror glass to the top right corner of the inset picture. 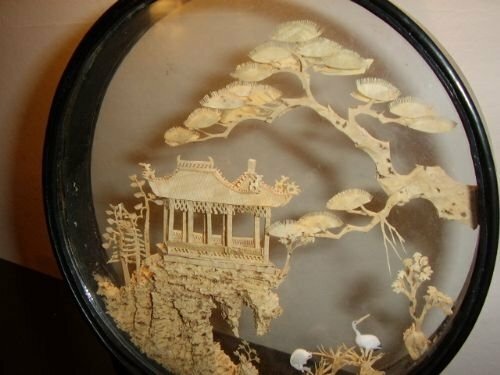 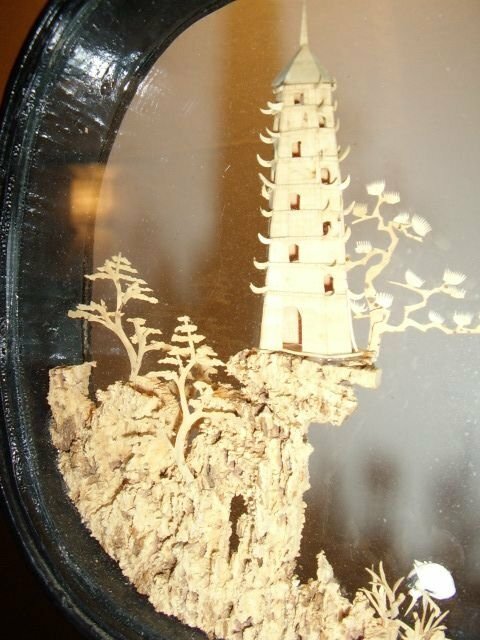 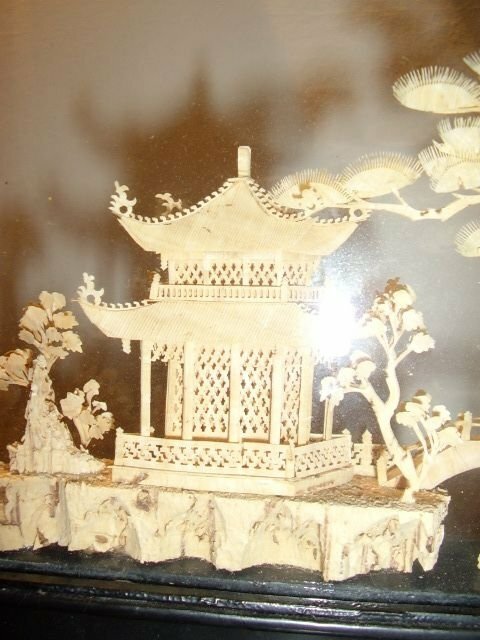 A fantastic work of art to see how a few pieces of soft cork material has been meticulously hand sculpted into a realistic scene showing an oriental style house with trees and birds. 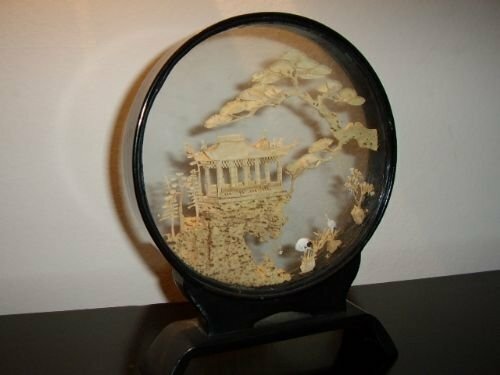 The detail and quality of work is amazing and to think that these were just tourist pieces for visitors to buy back in the 1930-50's. 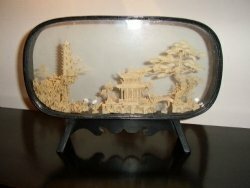 The display is cased in a black painted wooden cabinet with glass front and back to allow you to look straight through thus keeping dust off. 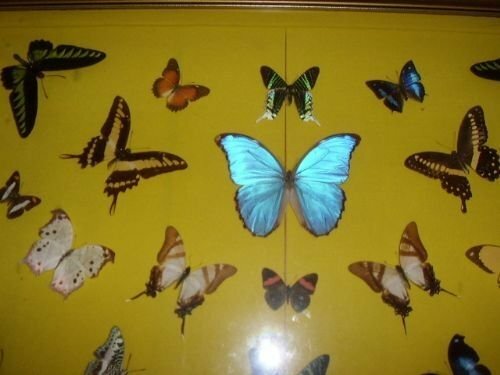 A fine collection of rare butterflies originally cased back the mid 1950,s by a lifetime collector. 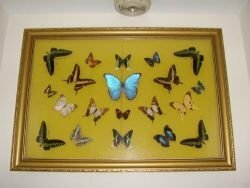 These exhibits have been professionally mounted and are in A1 condition. 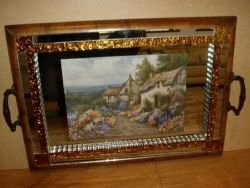 The framed case measures 33 1/2 Inches x 23 1/2 Inches and has a depth of 2 1/2 Inches. 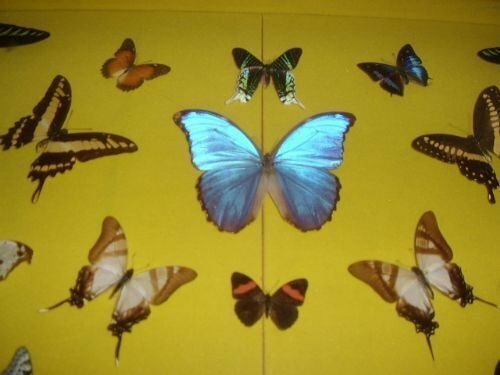 I am unaware of the various rare species. 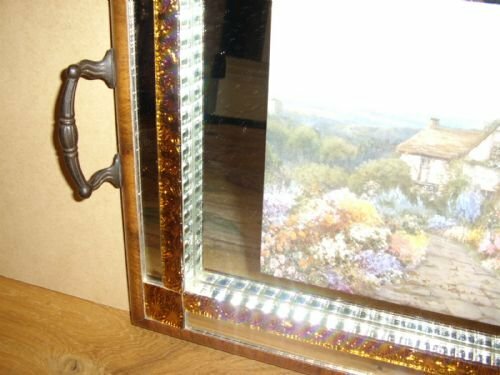 The case has been specially made and is finished in a mustard yeelow fellt and adapted for wall hanging,all presented under glass. 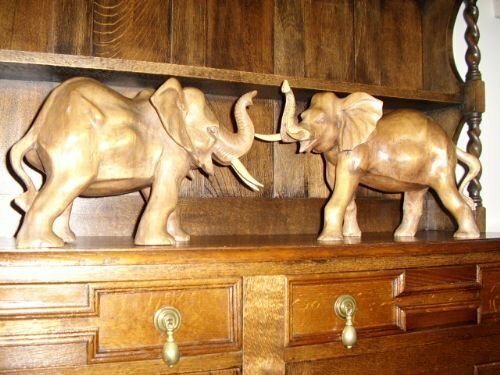 A lovely large scale pair of carved elephants (larger male bull & female) standing with their trunks in the air and with wooden tusks still intact. Full of motion and well modelled with a lovely patina,being well waxed and providing a great smooth feel ,showing off the amazing detailed grain. 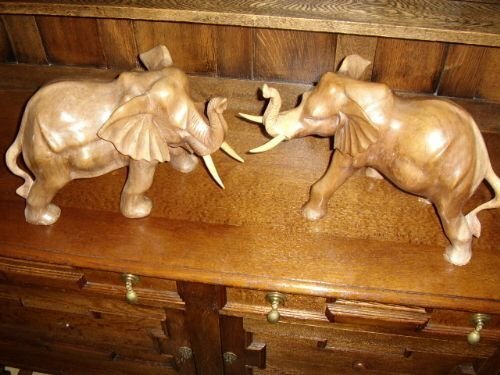 These carved elephants are of a professional standard,and note that the images do not really do them justice,compared to actually viewing them at first hand in person. 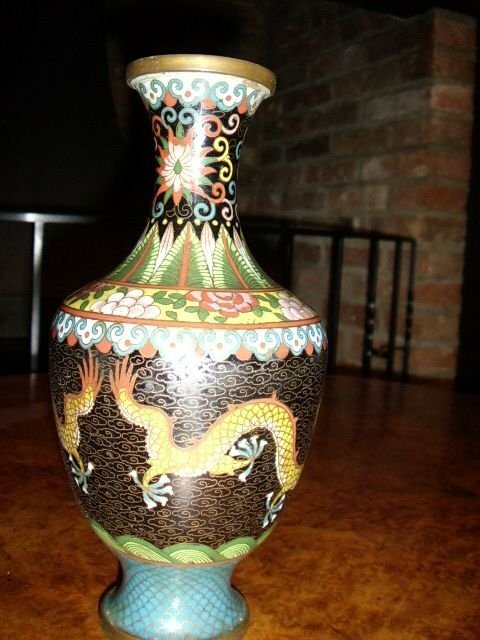 Condition is excellent,with no damage or repairs. 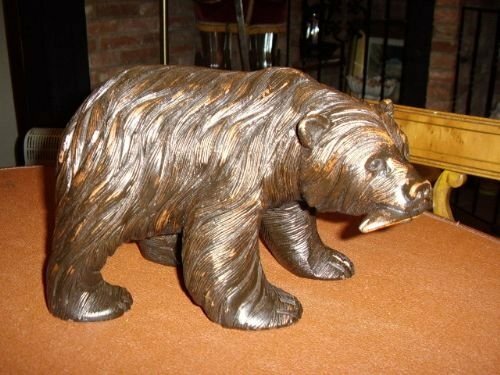 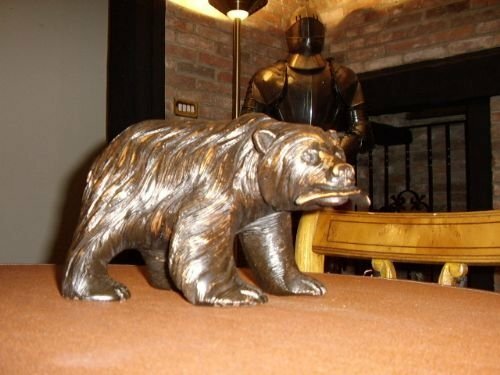 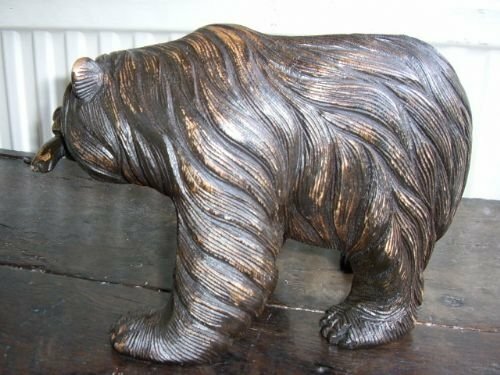 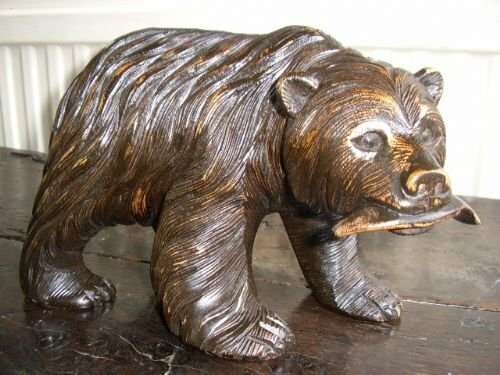 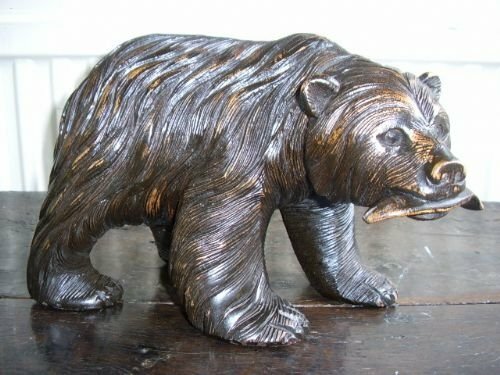 A good quality example of a reasonably large hand crafted Black Forest Bear,being intricately carved quite deeply,and carrying a dead Salmon in its mouth. 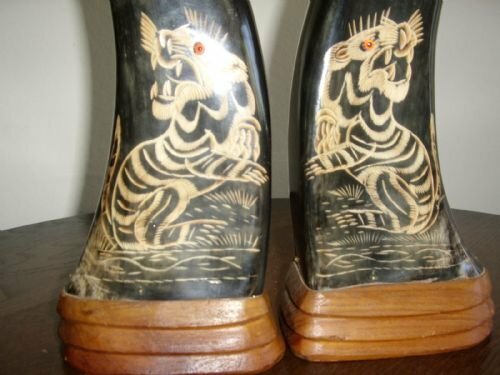 All in very good condition and with a nice darkish patina and an excellent posture in walking motion. 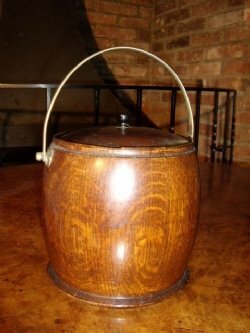 A sought after example,being much larger than most,and fairly hard to find like this today. 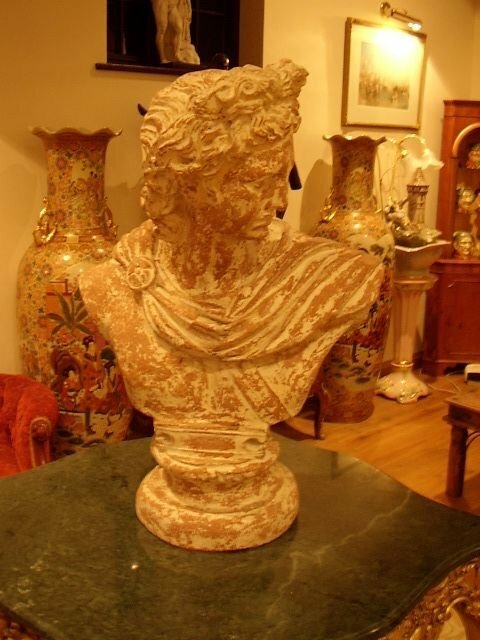 INCLUDES " FREE DELIVERY "
A nice example ofa reproduction fibreglass replica of a terracotta bust,depicting the famous Roman Emperior Julius Caesar. 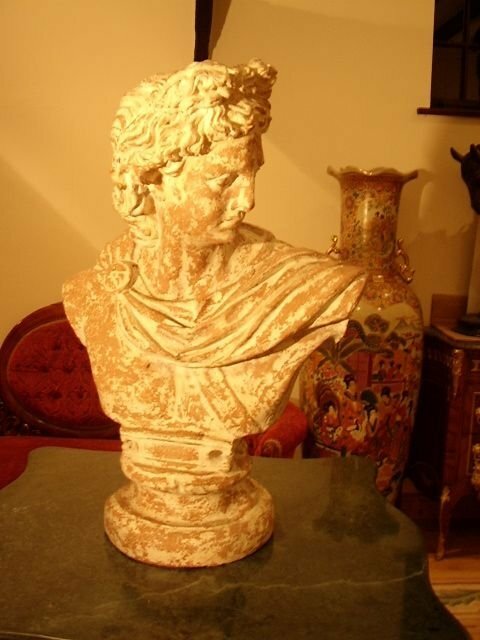 This item could furnish many a grand house and could sit on a stoneware pillar indoors or would be suitable for outside use in the garden as it is made from durable fibreglass. 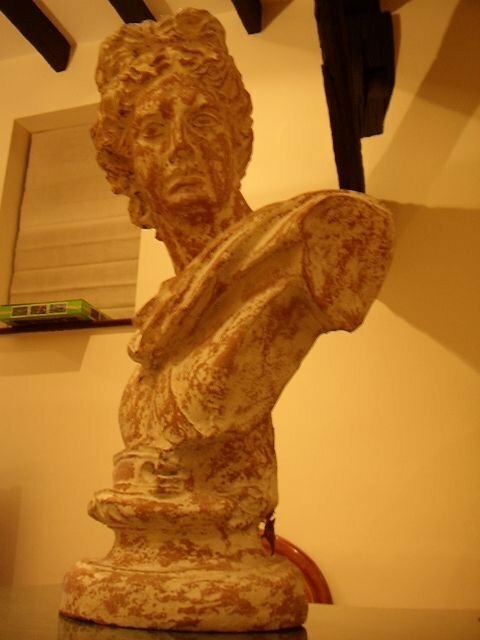 The realistic terracotta look is impressive and hard to distinguish from the much more expensive stone version.It can also be repainted annually in masonary paint using different colours. 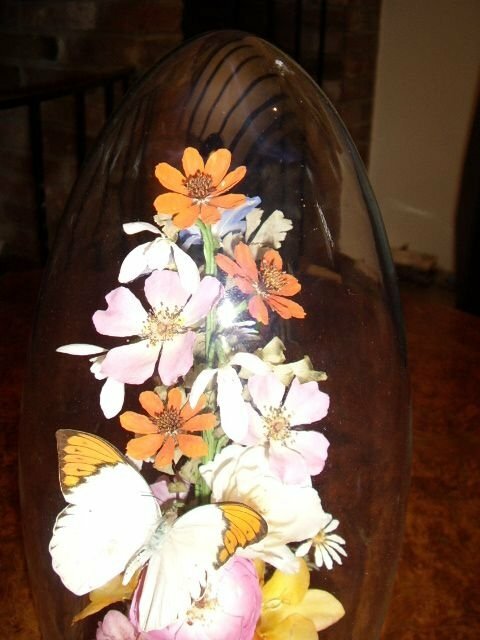 Measurements are 12 Inch Diameter at the base and the height is 32 Inches x Width 22 Inches. 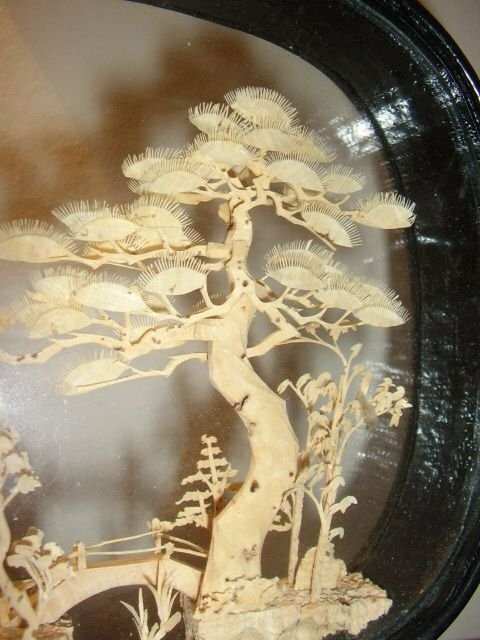 The hand craftsmanship in making these superb examples would have taken many skilled hours,being both labour intensive re the hours taken to just produce one finished specimen,and all aspects done by hand and originally produced for the tourists to take home with them. 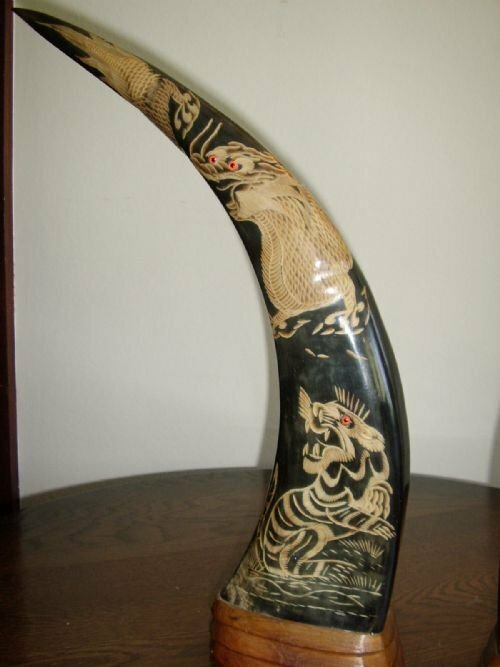 Mant cuts are made into the horn to implement a fine raised pattern and design,each showing a Chinese dragon with its tail wrapped tightly around the horn right up to the tip. 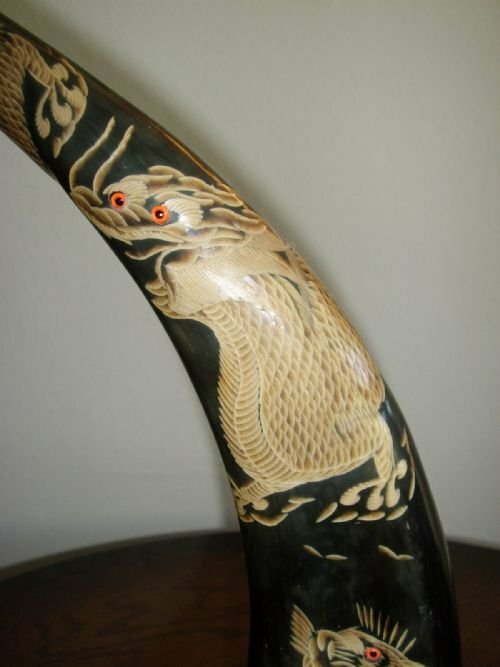 At the bases of each horn is depicted a fierce Tiger,shown growling at the dragon above. 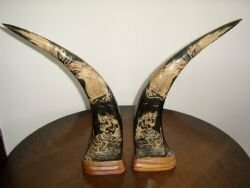 The base of each horn has been hand carved from a soft wood and is ribbed in design with a light coat of varnish to seal the surface. 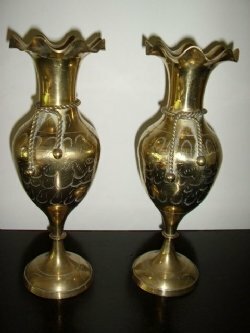 A fine matching pair in very good condition and still with the tiny red glass inset eyes attached in order to add realism. 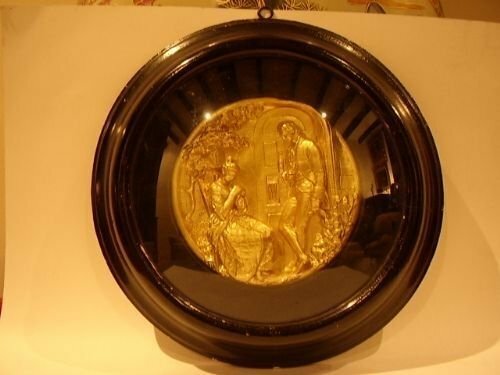 An interesting Edwardian finely cast plaster plaque depicting a gentleman holding a ladies hand in gesture. 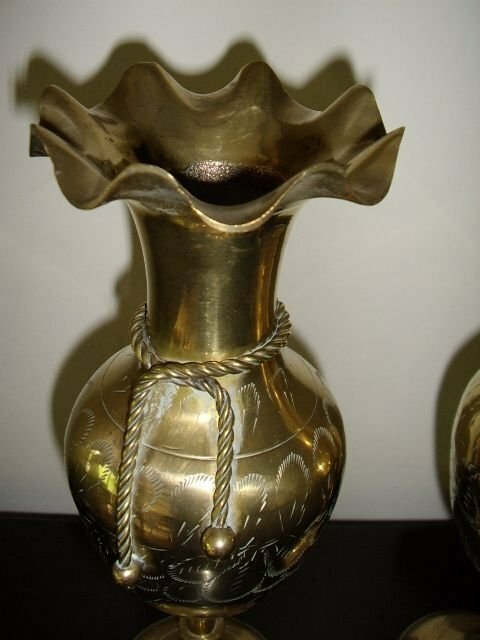 Finished generously in real gold leaf,the detail is amazing with alot of under cutting evident in the manufacturing process of the plaster. 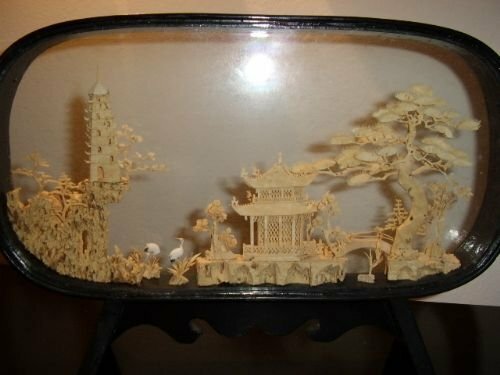 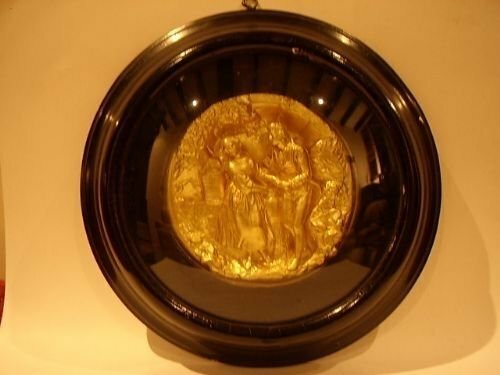 The scene is carefully presented under a convex glass set into a turned and black painted wooden frame.The backs being sealed with dark paper. 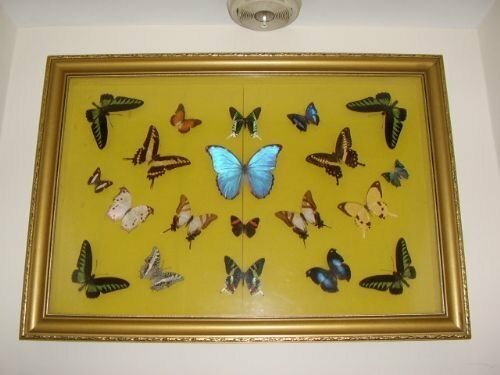 The condition is very good and there is a loopof steel to enable wall hanging. Measurements are 12 Inches in Diameter x 2 Inches in Depth. 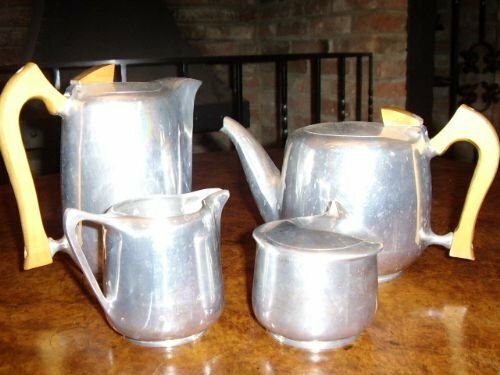 Please call us for a friendly chat about these items. 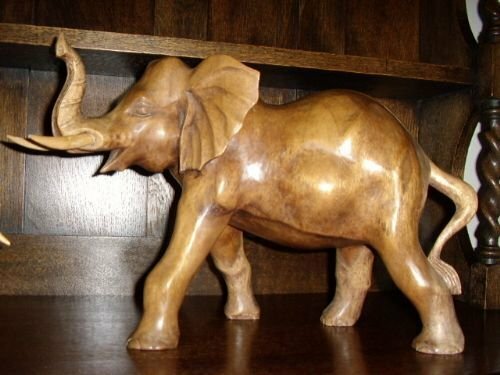 HOURS 10 AM - 10 PM 7 DAYS AW WEEK. 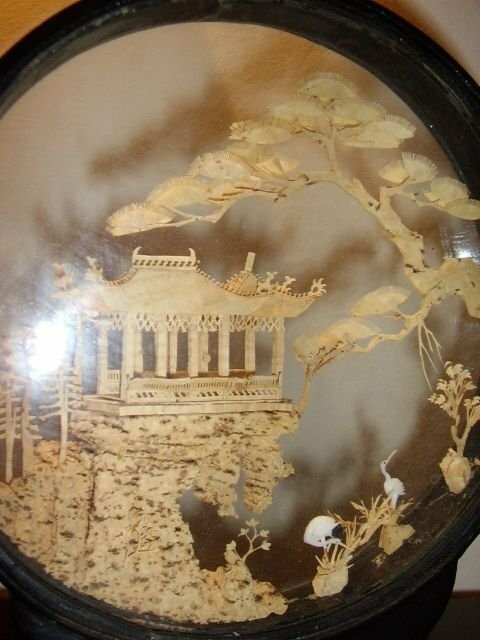 EDWARDIAN PLASTER & GILT WALL PLAQUE IN TURNED PAINTED WOODEN FRAME UNDER CONVEX GLASS. An interesting and very detailed Edwardian wall hanging plaque made from a fine cast plaster mix and covered in genuine gold leaf. 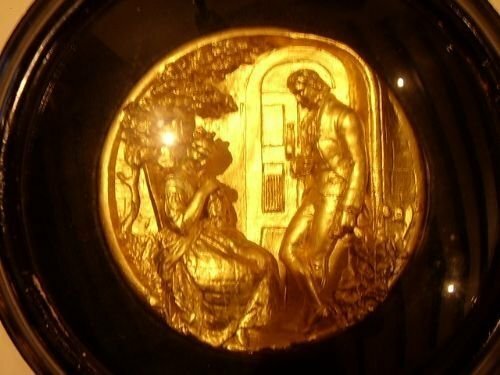 The detail achieved is amazing with much of the scene produced being under cut.The scene depicts a gentleman consoling a young lady. The frame has been specially turned and made to receive a convex glass cover to protect the plaster and has then been painted black. 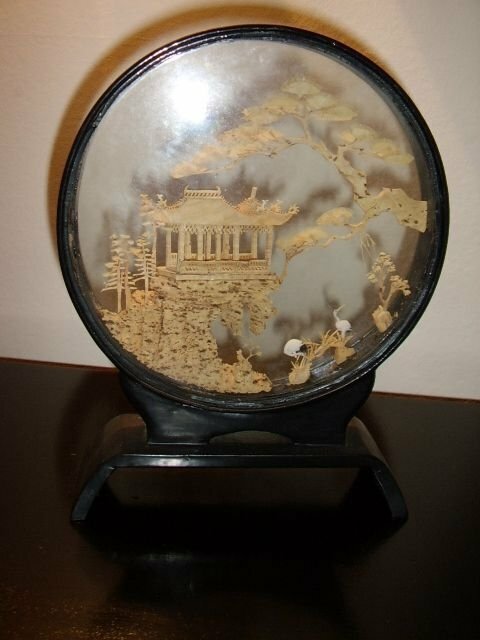 The Measurements are 12 Inches in Diameter and is 2 Inches in Depth. 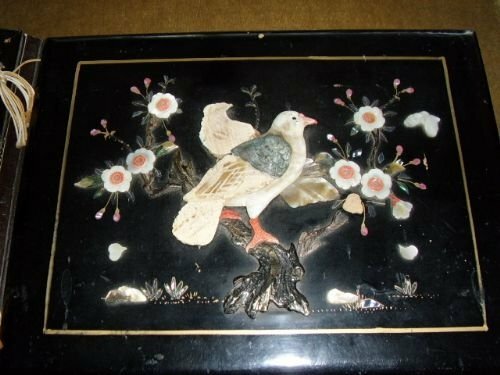 The back is sealed with black paper There is a metal loop attachment to enable you to hang this plaque on the wall. 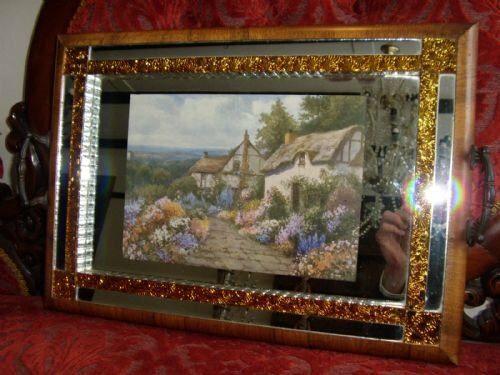 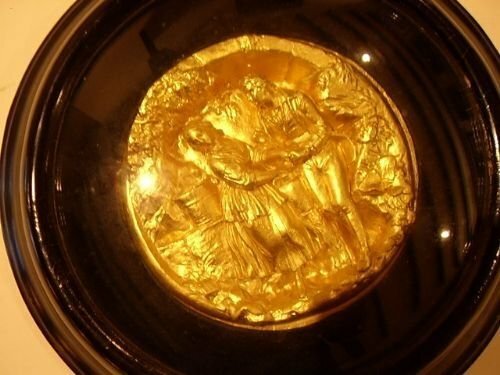 THIS ITEM IS ONE OF A PAIR BEING OFFERED SEPARATELY,EACH HAVING DIFFERENT SCENES. 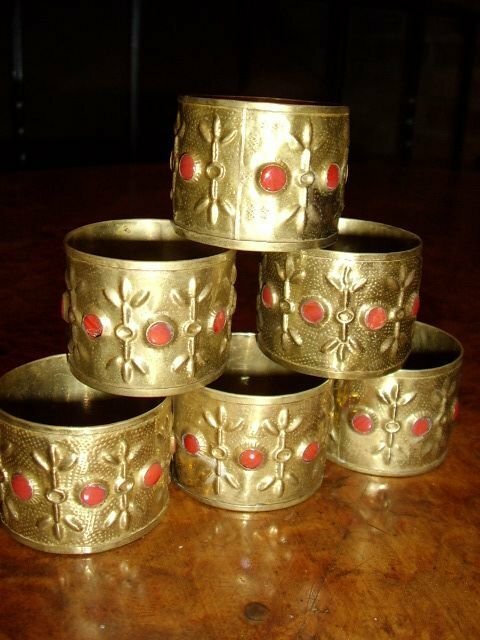 An unusaul set of Napkin Rinhs hich have been hand crafted in relief from polished brass and set with tiny cuts of polished Red Correl. 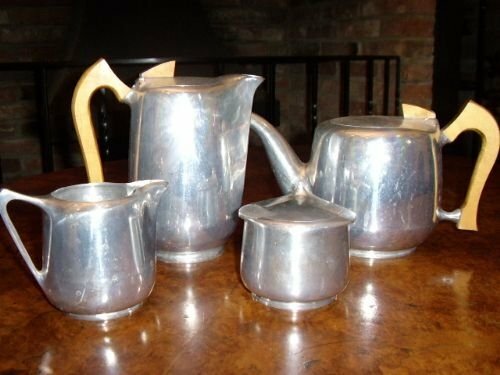 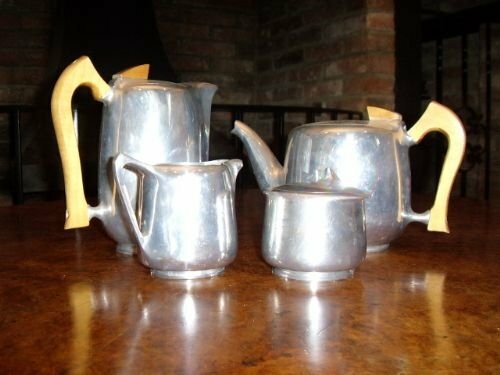 A fabulous 'Picquot Ware' Tea & Coffee pot set with matching milk & sugar,manufactured in alluminium from 1940 onwards to 1970's. 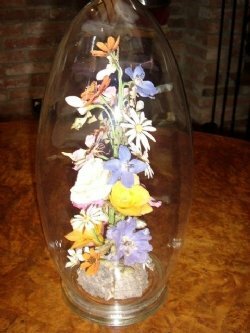 The design is inspiring and inovative and captures the imagination with this 21st century look,although originally created many years ago. Quite usable and clean inside,feels very lightweight,but at the same time extremely strong. 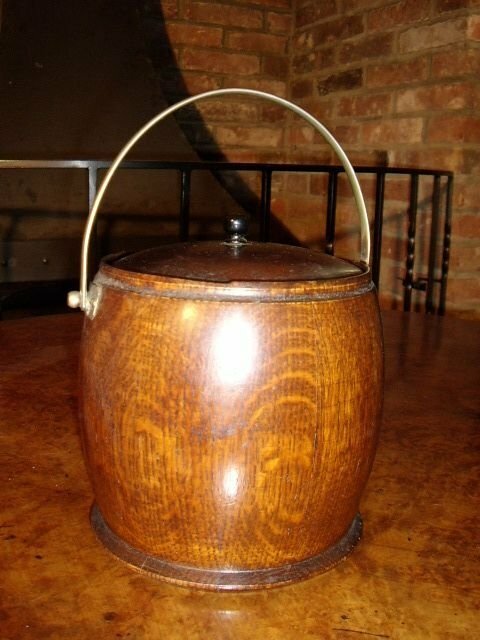 Finished to a with a semi-polished level,this set is in great overall condition ans has wooden handles lighly stained and varnished to seal them. 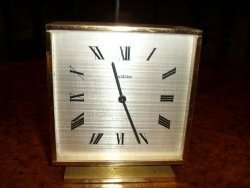 A collectors item with scope to increase further in value whilst being a very usable day to day item. 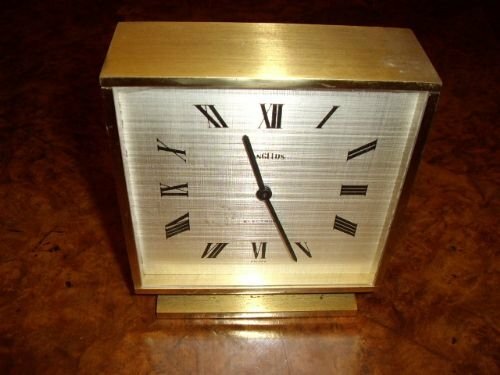 HOURS 10 AM - 10 PM 7 DAYS A WEK. 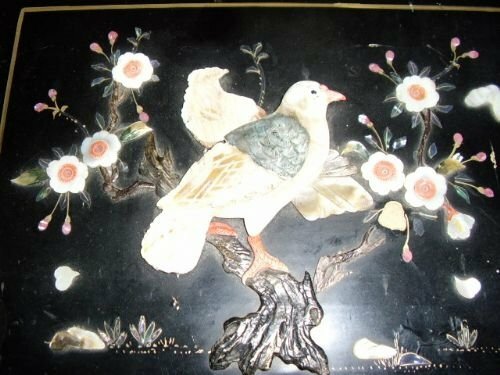 A beautiful black lacquered early post card & photo album,decorated with a Chinese design of birds and flowers,with mother of pearl inlay. 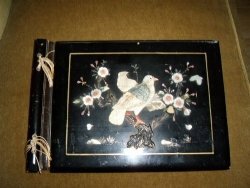 The album has all pages intact with the original thick card pages lined with tracing paper,to prevent items sticking to each other. 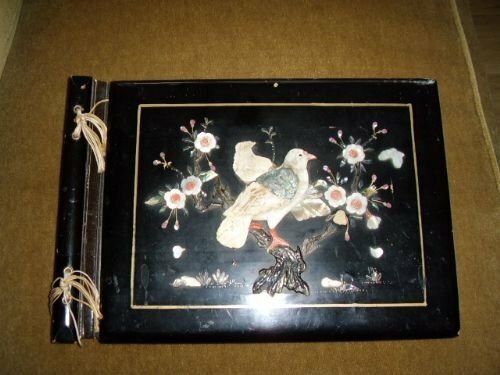 The album has been made from wood and has been paster coated and glazed in a black durable and hard enamel finish. 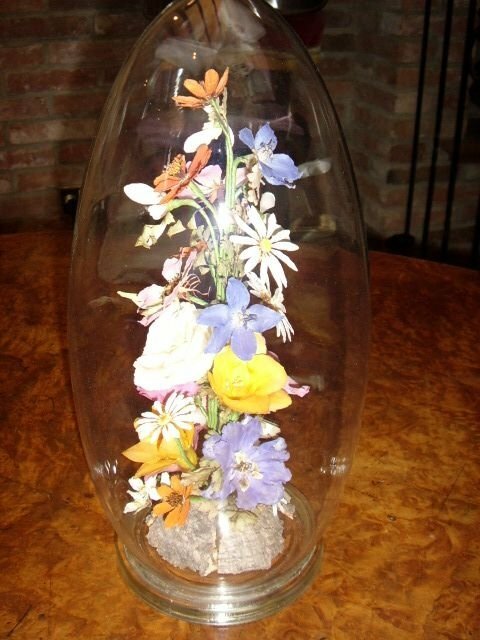 Measures 16 Inches x 11 Inches. 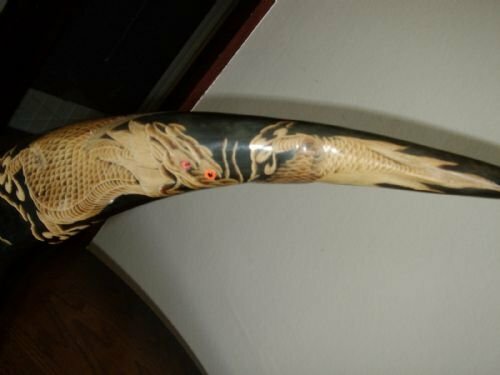 Condition is fairly reasonable for the age. 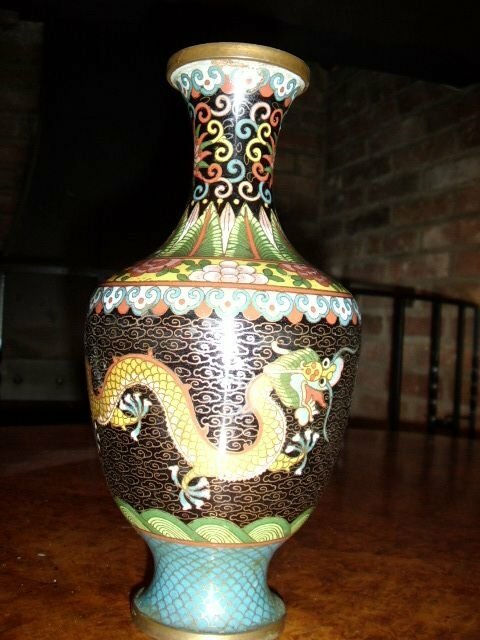 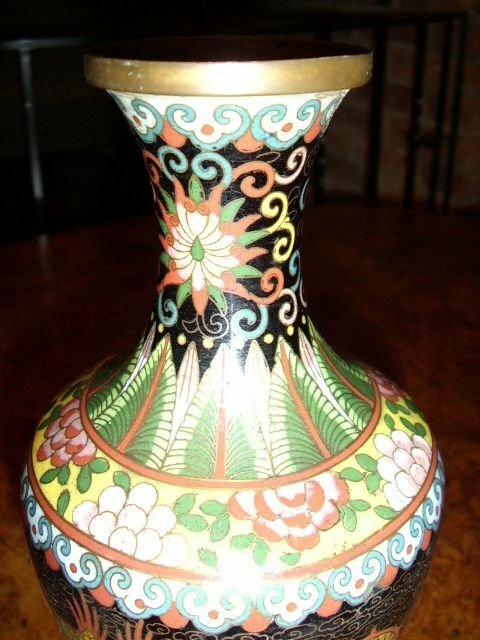 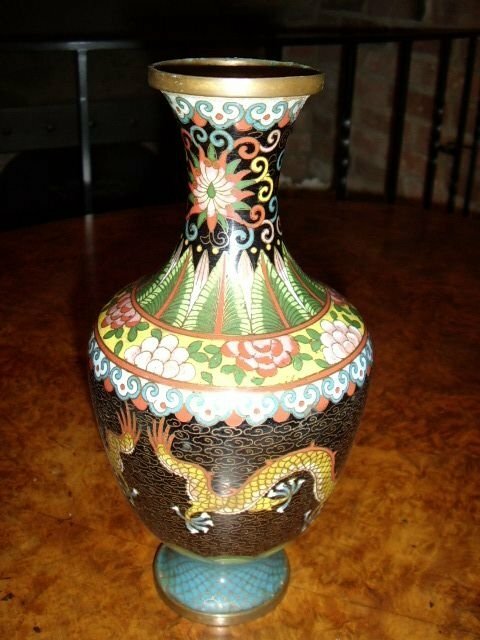 A nice example of a decorative Cloisonne enamel inlaid Dragon designed Vase. 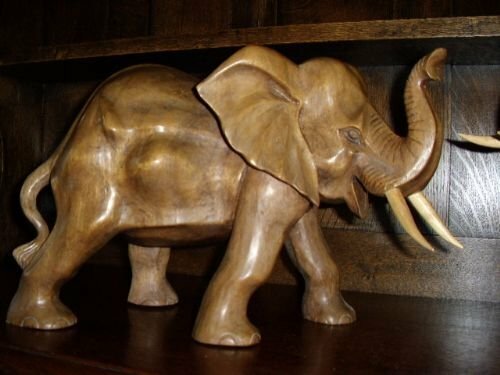 Finely made in great detail and impressive looking. 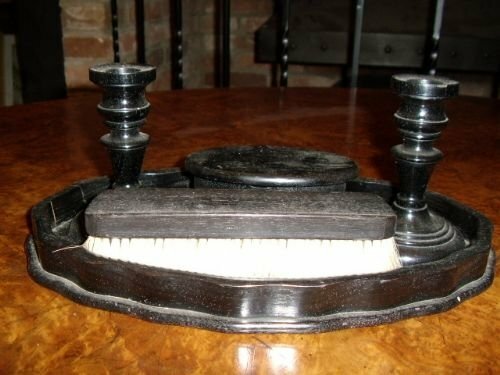 Condition is very good overall,with no dents. 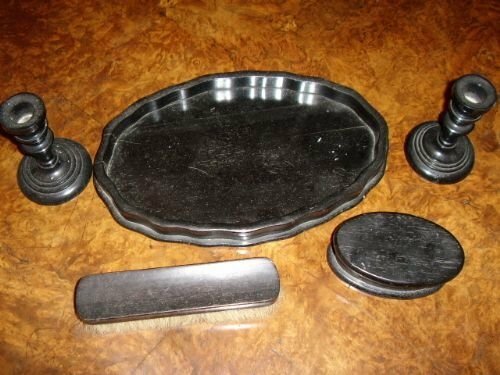 A bedroom dressing table set comprising an oval escalope edged tray,a small pair of candlesticks and a trinket box with hindged lid,all beautifully hand crafted from ebony. 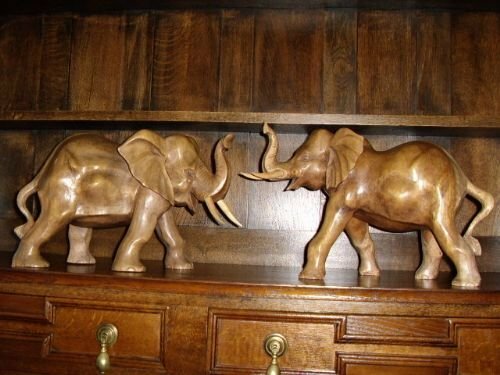 Since the photos were taken,we have re-waxed all the pieces in the set and they look great now. 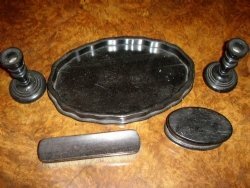 For anyone with a Victorian house and dressing table,this set keeps everything looking of the period. A nice pair of brass vases with rope braided ties around the fluted necks. They have a good polished finish and are in good order.